Joe Reid: Two subjects that haven’t gotten a lot of attention thus far get the spotlight in these two episodes: Chandler’s family life and Phoebe’s romantic life. Well, really any storyline specifically about Phoebe at all. 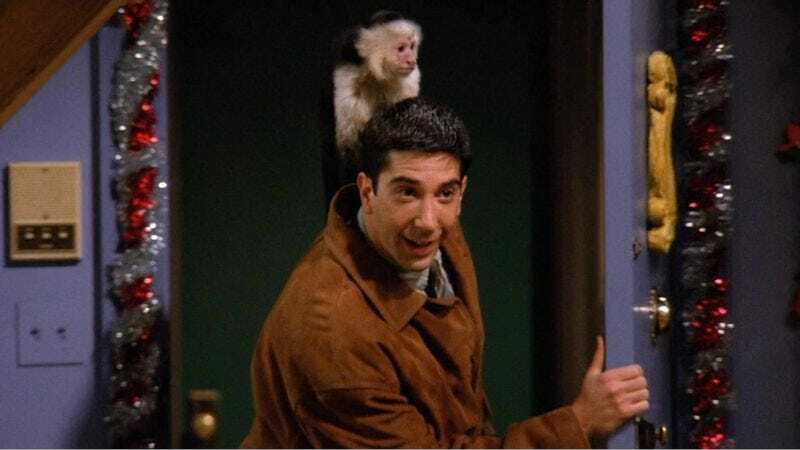 In “The One With The Monkey,” Phoebe has her first meeting with recurring scientician David, and his nerdily sweet superlatives about her beauty (as relative to Daryl Hannah) win her over. The only snag is that he and his partner have a job offer in Minsk (which, sorry Max, you big know-it-all, is in Belarus and not Russia). It’s no surprise to see that Phoebe is both a romantic and attracted to nerdy oddballs, nor that Phoebe in love is one of the most endearing facets of any of the Friends. But in particular, the scene on New Year’s Eve where Phoebe conducts both sides of David’s breakup conversation with her is such a delicate little dance of sweetness, sadness, and goofy humor, it instantly justifies Kudrow’s first-season Emmy nomination (“The One With The Monkey” was one of two episodes she submitted for consideration). As for Chandler and his mother, while Nora’s appearance puts a human face (and quite the glamorous one—hey there, Morgan Fairchild) on his numerous stories of childhood trauma, it’s still a rather prosaic and highly telegraphed storyline. Ross’s hapless whining about Rachel and Paulo and Nora’s excesses of sexuality are on a collision course from the beginning. More than that, while Matthew Perry does strong work in selling Chandler’s betrayal at the hands of his mom and his best Ross, it never truly feels like anything is truly at stake in their friendship. Sometimes, the more corny the weekly plot obstacle, the less you’re able to really invest in the fallout. Sonia Saraiya: Well, Joe, I just Googled Minsk, and Minsk was in Russia for over 100 years until the fall of the Soviet Union, which happened… before this episode of Friends… so… uh, never mind, there is actually no good reason whatsoever that the show thinks Minsk is in Russia. Phoebe is perfect in “The One With The Monkey”—it’s an episode that demonstrates how charming her space-cadet quirkiness can be, rather than just how funny it is. As you said, her breakup with David is lovely; one of the most emotionally affecting scenes of the season so far. I really like it when Friends can bring together the emotional resonance of a scene and the humor behind it; at its best, I think it’s able to deftly switch back and forth between both modes. Again, as you say: a delicate little dance. As much as I like the other characters, the only other actor who is so far able to make that dance happen for me is Chandler. And although I see your point about “Mrs. Bing,” I found myself really enjoying that episode, both for the conflict between Ross and Chandler and also for Chandler’s internal attempts to make sense of his own life. The quick, almost unnoticeable verbal slippage—the internal collapse that leads to resolve—it’s actually quite extraordinary work. I’ve never been sure if Matthew Perry has much in his wheelhouse besides Chandler, but seeing episodes like this, I’m really not sure that matters—he’s just that good in the role. Another thing I noticed about this pair of episodes is that they lack Geller family drama, which otherwise has dominated most episodes we’ve looked at. 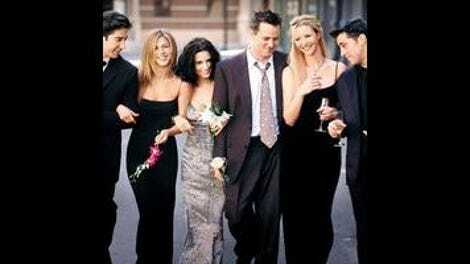 That lack makes the show feel more than ever like the Friends it grew up to be. In these two episodes the drama is also mostly drawn from the relationships the friends have with each other, and it’s great to see that process beginning. But there are flaws. Somehow, as soon as the focus moves to the six friends’ spats with each other, Monica becomes marginalized as a neurotic, and Ross, a loser. Both characters have more possibilities, but removed from family drama they become flat characters. Both characters eventually will have their moment in the limelight with their own great romances—but unlike Joey and Phoebe, who do a lot with their marginal work, and Chandler and Rachel, who get a lot of foundational material to work with, Monica and Ross feel surprisingly bland when they’re not the center of attention. I think this is one of the reasons why Marcel is so frustrating—wait, wait, you really want to complain about Marcel, so go for it! Is Ross fairly sympathetic when he explains that he got Marcel to help him deal with the loneliness of his post-divorce life? Definitely. His fear of missing out in his unborn son’s life is reflected through Marcel when Chandler reveals that Marcel started juggling balled-up socks when Ross wasn’t around. It’s revealing Ross’ character traits through silly situations, classic sitcom stuff. But all I can see is monkey and all I can feel is shame. SS: No, I mean, it’s true. It’s awful. Marcel has “stunt” written all over him, the poor little guy. It’s clear that the show’s writers are looking for a way to buy themselves some time—but also, as I began to say earlier, I think they’re looking to give Ross something to do. It is funny that Ross is sort of pathetic—but David Schwimmer is a much more able comedian than the material he’s given in these two episodes. It’s hard to imagine anyone except Schwimmer delivering the line about getting into a fight with Marcel with the same mixture of pathos and self-indulgent vulnerability—and as a result, it’s funny, despite what feels like a very silly plot decision. If Friends were a British sitcom—or perhaps a Netflix sitcom—I doubt we would have ever met Marcel. Because what’s clearly happening right now in the life of the show is that the Ross and Rachel romance needs to be put on the back burner, to simmer up until either sweeps or the season finale. In some respects, what makes Friends so frustrating is exactly this careful negotiation around network limitations, in an era when conventional network television was beginning to become less and less interesting compared to what was happening on cable and abroad. With Ross and Rachel’s relationship in particular, the show makes so many missteps that it’s hard to pinpoint when that magic begins to unravel. At the same time, though, the show’s ability to work with the constraints makes it all the more valuable as an artifact. It’s astonishing, given how clear the signals are right here at the beginning, that NBC milked the resolution of Ross and Rachel’s romance for ten years. That’s skill, if nothing else, and knowing how it ends, I’m enjoying seeing how the thread spools out.